College football has technically already returned, but we have yet to see any of the marquee teams take the field. But everyone is going to be getting in on the fun this weekend. There are even a few teams that are brave enough to take on a serious challenger right out of the gate— like Michigan and Notre Dame. The two will renew one of college football’s most historic rivalries Saturday night in South Bend at Notre Dame Stadium. But this will not be just any old rivalry game. We are talking about two of the most successful programs in college football history. But the past is not what anyone is concerned about. People are going to focus on how this game could impact the future. Win and you go from being a team people think could be a CFB Playoff team to one people talk about possibly being one. The winner becomes a legitimate contender. The loser falls behind the Playoff eight-ball before the season even gets going. It’s a bold move, playing such good competition this early in the season. But if you win, it a risk worth taking. Last season, the Fighting Irish had one of the most devastating run games in the country. But they lost their top running back to the NFL and a pair of offensive linemen as well. If they had much of a passing game, that might not be as big of a concern. 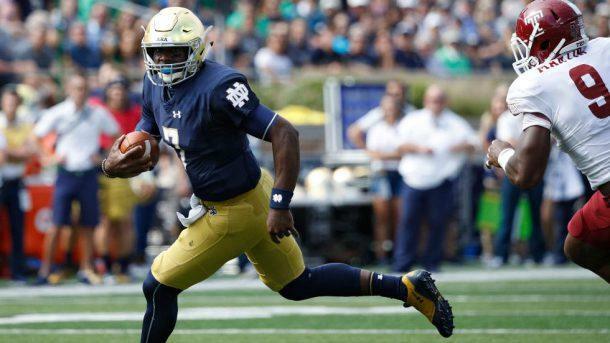 But Brandon Wimbush is not much of a passer; terrific runner, but a not-so-terrific passer. They have some big bodies to plug in for the offensive line. While they may not match up to the quality of the guys now playing in the NFL, they are expected to do just fine. Dexter Williams and Tony Jones will do their best to fill the void left by the departure of Josh Adams. Most of last year’s defense is back which means this year’s group should be just as good if not better. With some guys added to the secondary rotation, it could be even better. Teams will probably do what they can to avoid Julian Love which means the corner on the other side could be busy. Throughout the Jim Harbaugh Era, the Wolverines have had a great defense, a solid run, but have been lacking in one crucial spot— quarterback. But Harbaugh thinks (hopes?) he’s finally got that issue resolved with Ole Miss transfer Shea Patterson. If only they had an offensive line, they could count on to protect him. While his protection may be lacking, he’ll have some quality skill position guys to work with. Donovan Peoples-Jones and Tarik Black are a talented young tandem of receivers, and the return of Karan Higdon and Chris Evans will help get the run game on track. The offense has the potential for greatness, but it remains to be seen how well some guys will step up and how quickly everyone can get on the same page. But, luckily, they have most of last season’s outstanding defense coming back. If the defense can win the first few games while the offense is gelling, Michigan could be in for a great season. This one is going to be a slugfest. Defenses tend to get on track quicker than offenses at the start of the season. Both will need their defense to do just that while their offense tries to work out some of the kinks. Expect Notre Dame’s run offense to get on track sooner than Michigan, but they’ll still find it hard to move the ball against the Wolverines front seven. The key to the game for the Fighting Irish may be in the passing game. If they can get it going, maybe they can loosen the Michigan defense up. It’s possible—but don’t count on it. So, the game will come down to whether Patterson can get the Michigan offense moving. Notre Dame wasn’t great at putting pressure on quarterbacks last season which could mean Patterson will get the time he needs to throw. This is going to be a defensive battle with the winner being the one team that can catch a break or two. 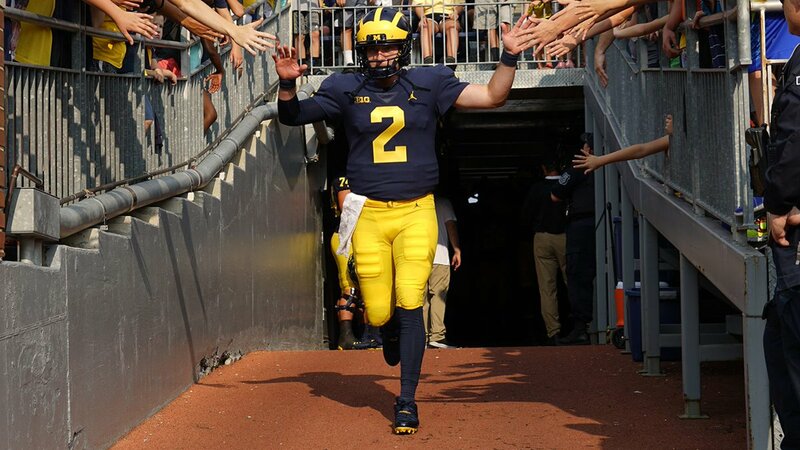 Shea Patterson is impressive, but he would have been better served with a soft opponent or two before taking on a team like Notre Dame. Notre Dame is favored by one—take the Fighting Irish to win and cover the spread. The over/under is 46.5—take the under.